Most of us see lighthouses as striking pieces of architecture and have a slightly bedazzled awe at how they were constructed in often hard to access or particularly rocky outcrops. Then along comes the occasional TV programme (remember that Aussie export Round the Twist?) to let our imaginations wander down less complex tracks. 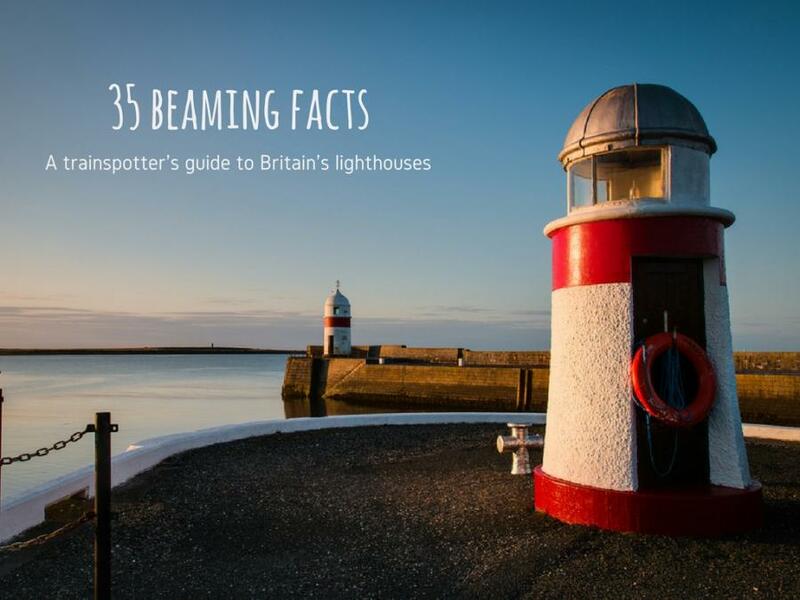 But fiction aside there are 60 or so lighthouses and nine ‘lightvessels’ that dot the British coastline as a marker of warning and as navigational aid for sailing vessels active in UK waters. They often appear in striking coastal photography too – a constant fascination piece for landlubbers with an eye for an arty snap. Left with a hankering for the views atop these towering life savers we bring you some of the UK’s most iconic lighthouses and a 35 lighthouse facts to go with them. The UK’s oldest lighthouse was built in 90AD at the behest of Roman Emperior Caligula. Wondering what it looked like? Well it’s still standing today in the grounds of Dover Castle. The Bishop Rock Lighthouse on the Isles of Scilly was built in 1884 after decades, if not centuries, of debate about its requirement. Way back in 1707 four Royal Navy ships were wrecked in the rocky waters beneath where it now stands killing 1,500 sailors. Britain’s tallest lighthouse is a Scottish claim to fame. Skerryvore off the west coast of Scotland stands at 49 metres. It was built in 1844 and is constructed from a not so measley 4,300 tonnes of granite. Lighthouses aren’t always tall, narrow structures either. The lighthouse at Ilfracombe is actually in St Nicholas Chapel atop the rocky hillock in the harbour. And this one’s worth the minor climb (with a track suitable for buggies if you can muster the muscles). Guile Point and Heugh Hill lighthouses that mark the entrance to Holy Island Harbour near Newcastle upon Tyne could be overlooked on the northern leg of your lighthouse tour – they are two stone clad obelisks that have wooden interiors. Crow Point Lighthouse is modern in look and mechanics. Designed so as not to require a lighthouse keeper, it’s steel structure is a little like a white painted pylon. It’s purpose: to guide vessels navigating their way along the Taw and Torridge estuary in North Devon. Other lighthouses protecting mariners along this estuary include the steel structures at Instow Front and Instow Rear. Bull Point Lighthouse as seen today was built in 1974 after the previous structure was damaged when the North Devon rocks beneath crashed into the sea. With a nod to its past, many of the original parts of the first lighthouse were modernised and used in the construction of the replacement. Cornwall’s Eddystone Lighthouse is the fourth such warning sign to mark the Eddystone Rocks south west of Plymouth and is actually named Douglass’ Tower. It stands beside the stump of Smeaton’s lighthouse that was partially demolished when cracks started to appear in the rock on which it was built. The significance of a lighthouse in this spot has seen rapid construction of each replacement tower and in 1982 the fourth tower became the first to begin conversion to automated management removing the need for a lighthouse keeper. We couldn’t mention Cornish lighthouses without referencing Lizard Lighthouse. First built in 1751 it marks the most southerly point of the British mainland. It’s now also the Lizard Heritage Centre where the former Engine Room is now a visitor centre and you can climb to the top to see the view for yourself. Our lighthouse factsheet wouldn’t be complete without a mention for Portland Bill. As one of the south coast’s newer lighthouses (it wasn’t built until 1906) it assists ships heading for Portland and Weymouth. Since 2015 the former lighthouse keepers’ cottages have provided fun and interactive exhibitions in the brand new visitor centre. For anyone who has braved The Needles chairlift on the Isle of Wight you’ll be familiar with Needles Lighthouse and appreciate the hazardous nature of these jagged rocks for passing ships. The current lighthouse with its helipad roof was built in 1859 (although the helipad undoubtedly came later) to replace a tower above Scratchell’s Bay that wasn’t all that effective at projecting light in the foggiest of weather. Lowestoft Lighthouse stands where coastal light and fog warnings have been since the 1600s to protect the ships and merchants in this busy shipping channel. Cromer Lighthouse stands proudly on Cromer Ridge amidst lush Norfolk foliage. The building here replaced a reliance on lights from the parish church to guide passing ships as once had been the norm in medieval times for coastal churches to provide assistance to passing ships. Southwold Lighthouse dominates the skyline of this sought after East Anglian seaside resort with its colourful beach huts and popular promenade. It has taken pride of place since 1887 to help guide vessels into Southwold harbour as well as steer passing ships away from the coastline. Whether you’re here for the day or taking your holiday in Southwold, you can fill a damp or chilly morning with a tour of Southwold Lighthouse. The Sunk Centre near Harwich is one of the more novel lightvessels. Positioned some 9 miles out to sea it helps traffic in and out of the Thames Estuary as well as passing vessels. It also acts as a weather station. Flamborough Head Lighthouse was first proffered in the 1660s yet took another hundreds years or so before it first shone in the early 1800s to assist North Sea traffic in to Scarborough and Bridlington. It’s actually England’s oldest surviving lighthouse that’s still in use. Before diaphone and electrical fog signals were respectively introduced, the lighthouse keeper would set off a rocket every 5 minutes during foggy weather that reached some 600 feet and hopefully caught the attention of passing vessels. Guy Fawkes would have loved that job and you can find out more at the lighthouse’s visitor centre. Farne Island Lighthouse is one of a handful of lighthouses that have been promised, debated, built, blown over, rebuilt and moved around the cluster of islands off the northern reaches of the Northumberland coast. The one you see today was built in 1811 and is an example of a lighthouse built with the keeper’s cottage in an adjacent single storey building rather than providing living quarters within the tower. The Farne Lighthouse has been powered by solar energy since 1996. Supporting the Farne Island Lighthouse is Bamburgh Lighthouse, the most northerly land based lighthouse in England. It has never been manned as it was only built in 1910. Prior to that a system of bells and guns set up in Bamburgh Castle ramparts provided much of the coastal warning sounds and signals for passing ships. Coquet Lighthouse is on Coquet Island off the Northumberland coast between Newcastle upon Tyne and the Scottish border. The lighthouse tower is unusually square and along with its keeper’s cottage has a grand turreted detail given the whole structure a regal air. Cumbria’s only lighthouse, St Bees, was first built in the 1700s to an astounding height of 9 metres. Destroyed by fire in 1822 it was the last English lighthouse to be powered by coal. The St Bees you see today is less towering and despite its age has more of an 1920s architectural feel. It’s position on the cliffs south of Whitehaven is strategic in its ability to guide vessels in the shipping lanes between Wales and the Solway Firth. Bardsey Lighthouse sits atop Bardsey Island, which is separated from the Llyn Peninsula of mainland Wales by Bardsey Sound. This is the UK’s tallest square lighthouse and you can’t miss it – it’s stripey! Anglesey’s lighthouses help steer ships navigating the Irish Sea and making for Liverpool. Point Lynas Lighthouse was built in 1835 after 70 years of relying on static oil lamps set into an existing tower on the north eastern tip of the island. Despite the castellated grandeur of the building, the lamp is actually set in what looks like a giant bay window. Perhaps Anglesey‘s most impressive lighthouse in structure and history is Skerries Lighthouse. Built in 1717 and now, with a bird’s-eye view, appearing to be part of a small enclave on a rocky outcrop it is also notable for its bold red midriff (not a result of forgetting the SPF while adhering to this year’s fashion must-have). The battle over its ownership and its history from financial greed to ruin to profitability is fascinating and as such it was the last privately owned lighthouse in Britain to be bought by Trinity House. It’s healthy credit status by the time that happened in 1841 resulted in a sale price of near half a million pounds! It’s actually Pembrokeshire that clusters up the lighthouses in some volume with them dotted atop bold rocky islands as well as the mainland coast. And they’re all of varying design, which makes for a fascinating trainspotting-type exercise if you can get close to them. Smalls Lighthouse seems a rather ironic name for a particularly towering structure on Pembrokeshire’s most westerly coastal point. Mumbles Lighthouse is one of the oldest that was built to guide vessels into Swansea Bay safely away from Mixon Shoal. Lighthouses have marked the rockiest edges of coastlines for centuries with the Egyptians noted as building Pharos of Alexandria as the tallest ever at 900 feet way back in 283BC. It is said to have guided ships safely away from the rocks for some 1,500 years until age and an earthquake got the better of it in the 14th century. A pharologist is someone who studies lighthouses – named after that very spectacular example in Egypt. Lighthouses were originally painted different colours so that sailors could differentiate them. Logically, that didn’t work so well at night. Thankfully the 1822 invention of the Fresnel lens by Frenchman Augustin-Jean Fresnel enabled hundreds of flashing light variations so that a lighthouse was recognisable by it’s light signals. Pre electricity, lighthouse keepers had to ensure that the lamp was lit at sunset and maintained throughout darkness hours. Obviously they didn’t sleep next to the lamp, so instead had midnight exercise in the form of hundreds of stairs up and down, to and from the lamp. Nowadays lighthouses are unmanned. The demanning of lighthouses began with the automation of lighting. The catalyst for this transition started with Gustaf Dalen’s invention that enabled the gas-lit beacons to emit short flashes of light instead of a constant light and in turn reduced gas consumption. His efforts won him a Nobel Prize in 1912. Today, the lighthouses and ‘lightvessels’ around England, Wales, Gibraltar and the Channel Islands are managed and maintained by Trinity House. Lighthouses in Scotland and the Isle of Man are managed by the Northern Lights Board and the Commissioners of Irish Lights are responsible for lighthouse across the entirety of Ireland. Trinity House was incorporated by Henry VIII in 1514 to serve and protect mariners. It’s motto Trinitas in Unitat reflects its threefold support for mariners: aiding navigation, pilotage and almshouses. Portland Bill was the name of the lighthouse keeper in the 1983 TV animation series. All the characters were named after British Sea Areas, shipping forecast terms and coastal weather stations. St Anthony’s Lighthouse in Cornwall featured in the opening titles of Fraggle Rock. The fictional Pontypandy lighthouse in cartoon series Fireman Sam is remarkably easy to access, climb and get locked out of (while on the balcony surrounding the beacon). There’s a popular animated series for young readers called The Lighthouse Keeper children’s books for anyone with a little’un who has a trainspotter’s fascination with lighthouses! So there you have it. A whistlestop tour of Britain’s coastal definers and mariner protectors. How many of them have you seen on your UK holidays?